The only effective protection against the unauthorized use of your archives images is to render them unusable with a watermark down the middle (that is removed for delivery). Let’s start with a crucial distinction. – First, archive images are different from portfolio images. – Second, the only effective protection against unauthorized copying is making the image unusable. Too often the images in photographers’ photo archives are viewable in a browser – sometimes in large format – without any protection. Occasionally a new client will tell me they don’t want watermarks on their PhotoShelter galleries because it “ruins the images”. Remember that when it comes to stock imagery our business, as professional photographers, is one of intellectual property licensing. Without tight control over the supply of our images we have no business. Simple as that. The problem of what one might call leaking archives is progressively getting worse: images displayed online are getting bigger as screens grow in size and in resolution. We can debate the best way to protect our work online but surely not the need to protect it. A Spencer Platt image from the Getty archives. There are a many ways to protect an image displayed online. Each one has it’s advocates. Only one is effective. Neither disabling right-clicks, nor overlaying transparent 1 pixel images, nor resorting to Flash slideshows will stop a thief from getting the original file from the browser’s developer tools or making a screen grab. Corner copyright notices? They are gone with a crop. The only way to protect an image is to render it unpublishable with a watermark down the middle. If you can’t stop thieves from getting hold of the file at least disable the file. True, now and then you’ll see an image used online with a watermark splashed across it but it is exceedingly rare. Most people prefer not to display their illegal behavior so blatantly. Professional publishers won’t do it at all. Don’t worry about spoiling the viewing experience of your archive visitors. Photo archives are not portfolios. They exist to make your catalog of images browsable, not to showcase your very best work. Of course once the license is agreed and paid for you will deliver a watermark-free image to your client. Since there is no such thing as a non-distracting watermark, I recommend marking portfolio images with small corner copyright notices instead. True, they can easily be cropped out but I do believe in the power of putting would-be chiefs on notice. It is an unending irony of professional photography that in order to pursue their business photographers have to make their very best work easy to steal. An Ashley Gilbertson image from the VII archives. An unavoidable but somewhat subtle watermark is an acceptable impediment to the viewing of your archive images. A professional photo editor — the kind of visitor your want browsing your images — will have no trouble seeing past your well-designed watermark. If a watermark-free version is required for a layout test then that is a new licensing opportunity for you (I discount comp fees from the end usage licensing fee if it ever gets that far). Most agencies watermark (surprisingly Magnum Photos doesn’t). Up to you to put together the least obtrusive watermark possible while preserving it’s “destructive” value. Remember to embed the watermark in the image itself. Overlaying a transparent watermark file on the image file via your website’s html code is ineffective as the browser downloads each component of a page separately. Theoretically PhotoShop’s content awareness is able to remove an embedded watermark by guessing and rebuilding the hidden content but it is far from an easy thing to do well. What should a watermark look like? Since you are adding information over the image you might as well use it to establish the latter’s origin, you. Your system may not allow you to use each image’s reference details as the Getty website does but you can certainly use your name or your url, or both. If someone grabs your watermarked image for layout testing and then shares it with colleagues or adds it to an internal library at least the path back to the source will always be attached to it. Using a generic copyright symbol is a missed opportunity. 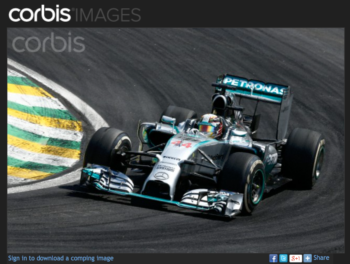 Corbis used watermarks but placed them in an easy-to-crop-out spot. 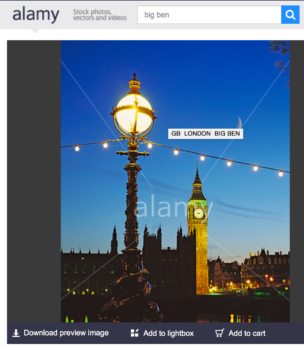 It’s smack down the middle for Alamy. A copyright notice in a corner is a whole other kind of instrument. It serves to remind viewers of the copyrighted status of the image. And it does that job well. A small but unmissable corner notice “ups the copyright ante”. An infringer can no longer hide behind a faked ignorance – both a legal and a psychological impediment. But there is no denying the fact that it will not survive a ruthless thief’s cropping tool. Watermarking images one by one is obviously a painstaking affair. There are tools to batch process the job but unfortunately none that is a delight to use. PhotoShelter will embed a watermark with a click of a button across all archives images (it can be disabled on a per gallery basis) but of course it only applies to archives hosted on their servers. An online image processing service like Cloudinary will embed an overlaid image effectively.